Recently our Facebook page hit a fantastic milestone...500 5 star reviews! 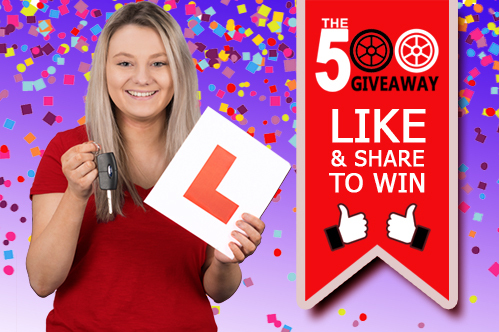 To celebrate this fantastic achievement, we are running another one of our driving lesson giveaways, this time bigger than ever with the help of our friends over at Marmalade Insurance! To enter the competition, simply head over to our Facebook Page and like and share our pinned post. For an extra 5 entries into the competition, simply click the button below and pop in your details. Competition opens 12:00 25/10/2017 and closes 12:00 8/11/2017. Winners will be chosen at random and announced through our Facebook page. We will also contact the winners directly wherever possible. Driving lessons vouchers can be used to purchase driving lessons with any Around the Bend (UK) Ltd or DRM Driving School instructor. Lesson vouchers must be used in conjunction with the purchase of additional driving lessons. Cover is available in the majority of UK postcodes for learners aged 17-34, on a car up to £30k in value, 20 years old and insurance group 32. The policy covers a driver to practise in a car that is owned and insured by someone else. Insurance cover will expire on passing your test. Click here for full details on Marmalade’s Learner Driver Insurance.